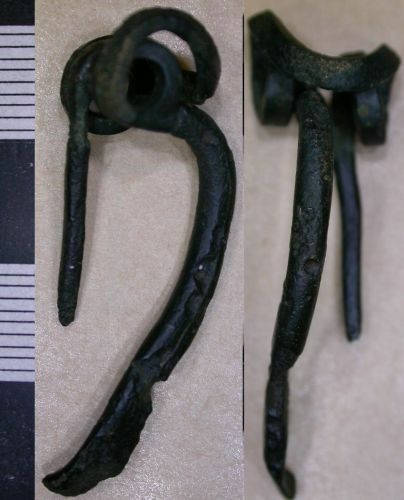 Late Iron age copper alloy brooch, 40mm long, 12mm wide and 2mm thick, weighing 4.27grams. The brooch consists of one piece of copper alloy wire which is square in section. This forms the pin which is twisted twice at teh head of the brooch to form the spring. The wire then roundens to form the main body of the brooch and then flattens towards the end to form the catchplate. The brooch fits the Le Tene III style of late iron age brooches, similar to 9 or 12, fig.149 in Hattatt. It has a dark brown/black patina and is an a fair condition as its is missing the edge of its catchplate and has some pitting in its surface.